Dental cleaning is more than an elaborate version of your dental care at home. If you brush, floss and use mouthwash daily to keep your mouth clean, you may wonder why skipping your regular dental cleaning appointment is a big deal? Routine dental cleaning is vitally important to the overall health of your teeth and gums. Without it, all your brushing and flossing at home can be ineffective for the prevention of oral health problems. Also, missing even one appointment might trigger serious dental and health issues. A significant number of literature and scientific research show the connection between oral and overall health. This should encourage you to visit your dental team regularly. Here’s how dental cleaning can save your mouth and body health. Prevent cavities – plaque is made of acidic substances that eat away at your tooth enamel. If left unattended, this can eventually cause cavities. Plaque and tartar can be totally removed by at home dental care and professional dental cleaning. Prevent or minimise effects of diabetes – unhealthy gums can trigger various dental conditions and diabetes can adversely affect gum and tooth condition. People suffering from diabetes are more susceptible to gum disease. On the other hand, gum disease can affect blood glucose control and add to the development of diabetes. Reduce the likelihood of heart diseases – oral bacteria can make its way into the bloodstream, which increases your risk of a heart attack or stroke. Boost your overall health – regular dental cleanings may help your risk of developing serious diseases such as heart disease and stroke. 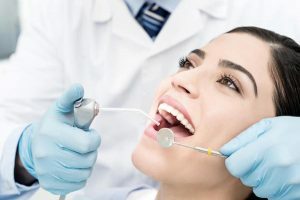 Moreover, several health conditions can be detected in their early stages during an oral exam, which is part of your routine dental cleaning appointment. Save money – prevention is the best care you can offer for your oral health. It is less expensive and complex than a cure. With routine cleanings you can prevent oral health problems resulting in lower dental expenses. Your dentist combines teeth cleaning with your routine check-up every six months. The procedure involves the removal of plaque and tartar on the surfaces of your teeth and gum line using special instruments. Dental plaque is a soft and sticky film of bacteria that naturally forms on the teeth. It can be easily brushed and flossed away. However, if the plaque hardens and turns into tartar, only your dentist can remove the build-up. Your dentist will eliminate the tartar with a dental instrument called “scaler”. Once the tartar is removed, your teeth are polished to remove the surface stains and smooth out the enamel, making it less hospitable to the build-up of oral bacteria and plaque. To complete the procedure, your dentist will finished it off by applying a topical fluoride treatment in order to remineralise the teeth and prevent tooth decay. Are you overdue for your dental cleaning appointment? Your trusted Deer Park dentist at Smart Smile Dental encourages you to schedule an appointment today. Let our dental team helps you save money on your dental expenses by keeping your oral health at the highest level. At Smart Smile Dental, we don’t just make your smile healthy and beautiful, we can also save your life.